The Minnesota North Stars are no more, but their uniforms live on in the hearts and minds of their fans. The Minnesota North Star jersey, with a logo that remained basically unchanged from 1967 to 1991, had a simple design and original color scheme, parts of which live on in two places — in Dallas, the new home of the North Stars, and also in Minnesota, where the Wild recently showed how wild it is about the Minnesota North Stars Jersey. More on that later. Hockey trivia question: What do Count Chocula, the Trix rabbit and the North Stars logo all have in common? Answer: They all were designed by George Karn, a commercial artist who lived in the Twin Cities area. Karn was a big hockey fan who won a design contest sponsored by the original North Stars management team to come up with a logo for the new franchise. Karn came up with a number of design concepts, but one stood out from the pack. 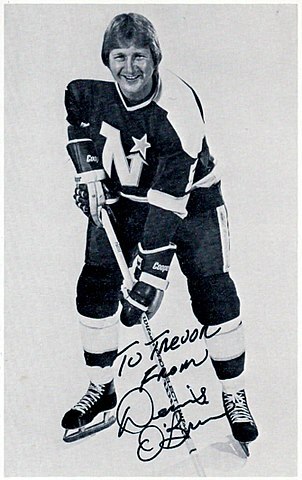 His “N” pointing to a gold star and white-green color scheme adorned North Stars jerseys from the team’s entry in the league in 1967 through the 1990-91 season, two seasons before they became the Dallas Stars. Early iterations of the North Stars jersey were ultra-simple, having the logo in front, player number in back, and a dash of gold and white striping on the sleeves and base of the jersey. In 1972, player names were added. In the years that followed, striping design was frequently tweaked, and the logo underwent a few minor changes as well. For the 1991-92 season, Karn’s design was abandoned, with the North Stars going to a logo that read “STARS” with a gold-bordered green star forming the “A.” This entirely new logo was used when the team became the Dallas Stars and survived with various tweaks all the way to 2014. It has been said that imitation is the sincerest form of flattery. If the mark of a good NHL uniform design is imitation, the Minnesota North Stars jersey has earned a very high rating indeed. Even though the Minnesota Wild is an entirely different franchise, the team honored the North Stars jersey in a big way in 2017, when it rolled out throwback uniforms featuring the original North Stars design to commemorate that franchise’s 50th year in the NHL. This was a classy move by the Wild, who appreciate how important having an NHL team was to Minnesota hockey fans. They had been without a team prior to 1967 and from 1993 until 2000, when the Wild took the ice. The North Stars uniform stands out from the crowd for a number of reasons, which is why Pro Stock Hockey selected it as one of our Top 8 uniforms. The choice of green for the primary color was something the NHL hadn’t seen since the Toronto Maple Leafs were the St. Pats from 1919 to 1927. Not only was green something new, it was also a very appropriate choice for Minnesota, with its pristine forests and 10,000 lakes. The primary “N” logo is simple, powerful and brimming with confidence. The upward arrow pointing to a star suggests high aspirations and positive results — there’s nothing indecisive in this logo. And, as mentioned earlier, the Minnesota North Stars logo has stood the test of time, still loved by hockey fans in Minnesota even though the fans there are solidly behind their new NHL team.